PHUKET CITY: Phuket’s bars and entertainment venues may be allowed to open later again, if their owners can convince the authorities that they are seriously taking action against under-age patrons, drugs and drunk-driving. The Phuket Entertainment Business Association had lobbied the minister for early-closing rules to be eased because, it argued, many of its members cater to tourists who don’t venture out to play until midnight or 1 am – precisely the time when, the new order says, most venues must close. K. Bhokin said, “We do understand that Phuket is a place for tourism. Tourists expect to have fun here, and that is fine, so long as there are no drugs, no excessive drunkeness and no under-age patrons involved. “I have told [Phuket Governor Udomsak Usawarangkura] to consider what he thinks would be the best thing to do about the early-closing order. K. Bhokin said it made no difference whether a city was a tourist destination or not. The point was that venues must be free of under-age drinking and drug-taking, and the patrons must not drive drunk. The minister was in Phuket for the official opening of the new Consulate of the Kingdom of Morocco, which is in ST Plaza in Phuket City. 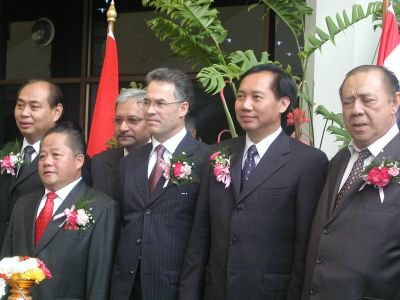 K. Bhokin told 200 or so guests at the nearby ST Hotel, including the new Honorary Consul, Valentino Tan, “It’s very good for both our nations that we have a Moroccan Consulate in Phuket, especially as we have a sister city – Casablanca – in Morocco. Mr Tan said that the new consulate will “open doors” for people in Phuket and Morocco and bring about a greater flow of trade and investment. The Moroccan Consulate in Phuket is at 5/43-44 Soi ST Plaza, Sakdidet Rd, Talad Neua, Phuket 83000. Tel: 076-219881/2.